Kozakblack - Colorado Awesome "Great colors for the price and feels real great!" Jeff23 - North Carolina Great Helmet "I Bought this for my 14-year-old son and he loves it looks great feels great. And would most definitely buy it again"
As a teenager, motocross racer Troy Lee started a helmet painting hobby in his parent's garage for his friends and little did he know not only would his hobby turn into a career but Troy Lee Designs now manufactures its own product lines. Troy Lee helmets not only dazzle with their famous designs but also provide leading edge comfort, quality and ventilation. Take for example the Air helmet with state-of-the-art multilevel internal vent system using 12 individual intake channels and five large-sized exhaust vents. The higher-end SE3 series brings a dual density Shock Pad System and EPS liner. A new nose guard design improves airflow while providing maximum roost protection. 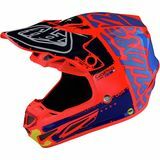 Both Troy Lee helmets meet SNELL M2010 safety standards. MotoSport carries seven different designs in the Air and SE3 models. We can help you decide on the model best Troy Lee helmet suited for your riding but we can't tell you which design! That's up to you. 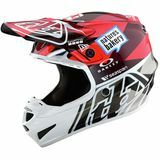 MotoSport is the best place to find Troy Lee helmets. Use the size charts to help you take the guess work out of selecting your product. Even if a product doesn't fit, our hassle free return policy means we make it easy for you to get the right one. Want help? Call our toll free line 866-677-7338, chat with an expert or check out our Dirt Bike Helmet Buying Guide.